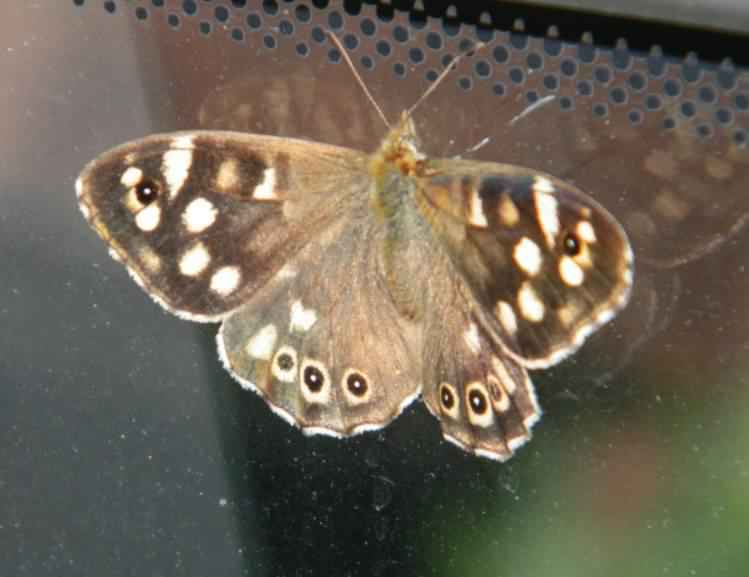 A resident butterfly in the UK with a wingspan between 32-45mm (1.3-1.8in). Found in deciduous woods, Beech and Oak forests in most of Europe to Africa and Asia. They fly in partially shaded woodland with dappled sunlight, highly territorial males ♂ often perch in sunny spots, spiralling into the air to chase each other. 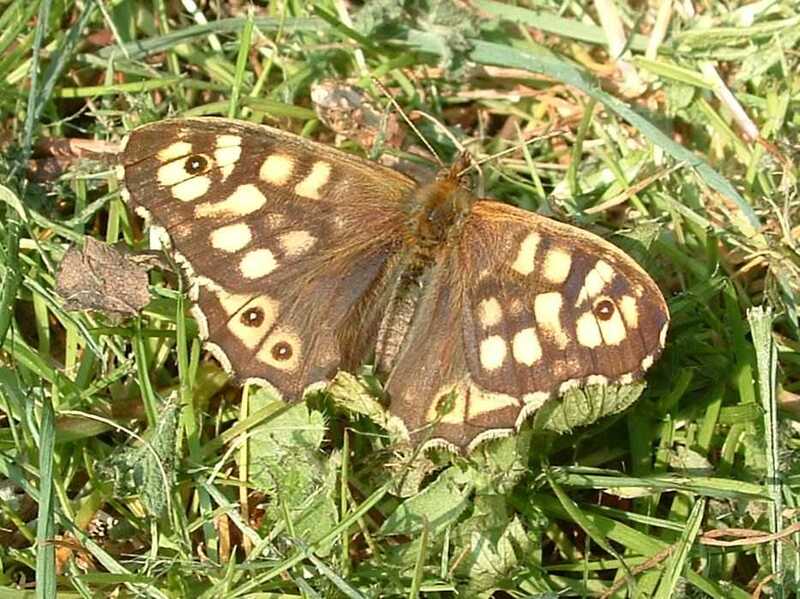 In the UK it is common only in southern England, local further north and rare to absent in Scotland where it is re-colonising. There are two generations in a year, the first from March to early June and the second in July to September, and possessing a unique ability to over winter in two totally separated developmental stages, as pupae or as half-grown larvae. 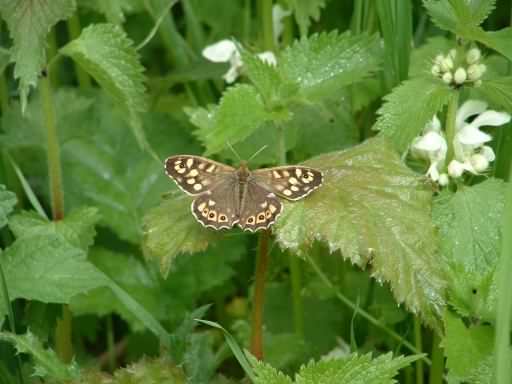 Overall brown in colour with pale brown or white patches, more on the forewings than the rear. The appearance of this butterfly shows a geographic variation where individuals in the north are dark brown with white spots, with those in more southerly locations being dark brown with orange spots. Spherical light green eggs are laid singly, or sometimes in pairs, on the underside of the foodplant leaf. Caterpillars are green with a short, forked tail and feeds on various species of grass especially Couch. The chrysalis (pupa) is green or dark brown. Caterpillars are found during the summer on varied Grasses used as food plants, including False Brome - Brachypodium sylvaticum, Cocksfoot, Yorkshire Fog and Couch. 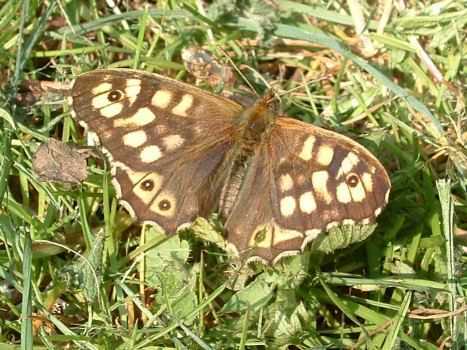 Conservation status - Speckled Wood is not listed as a UK BAP species, it is of low conservation priority and not threatened. Adults feed primarily on Honeydew but nectar from Bramble, Cuckoo Flower, Dandelion, Fleabane - Pulicaria dysenterica, Privet and Common Ragwort are also used.